Achieve Garage Sanity Before the Storms! This is that small window of time, before Spring, to finally get that garage of yours cleaned up and cleared out. The summer heat is behind us and the cold, wet weather is just around the corner. Except perhaps, for those of you who live in the colder states who may already have wet weather by the time you read this. In any case – this can be done – and the sooner you start – the better. Garages are the one place I actually don’t help clients with in person (I do it via Skype, however). That stuff is heavy, filthy, and sometimes hard to figure out how to make it just go away. If you are feeling any of this, it isn’t a wonder why garages pile up and then get left for ‘someday’ which never seems to appear. So, here is the secret sauce to getting this nasty project done: Just schedule to START it. * Maybe you can begin by culling all the cardboard boxes you have been holding onto from all those Amazon purchases and break them down to either keep (just a few good ones), or recycle. Is there some old sports equipment that no one uses anymore than can be donated? * How about some broken junk you won’t actually fix, nor use again? Just get rid of that stuff. Don’t over think it. * Put the items you are donating into your car right away — not another pile in the garage somewhere — and schedule to bring it to the center you are giving it to. You must be proactive to get rid of stuff. * Schedule time in your calendar to go through trouble areas. 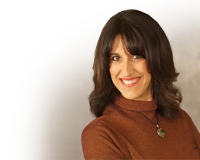 Hiring a Professional Organizer to work with you may be the best option at this point. Someone who can guide you on the decision if that is where you get stuck. Or perhaps you just need someone who is stronger than you to lift and move things around – hire someone for this and get that done already. * Lastly, create a ‘home’ for everything left that you are keeping. 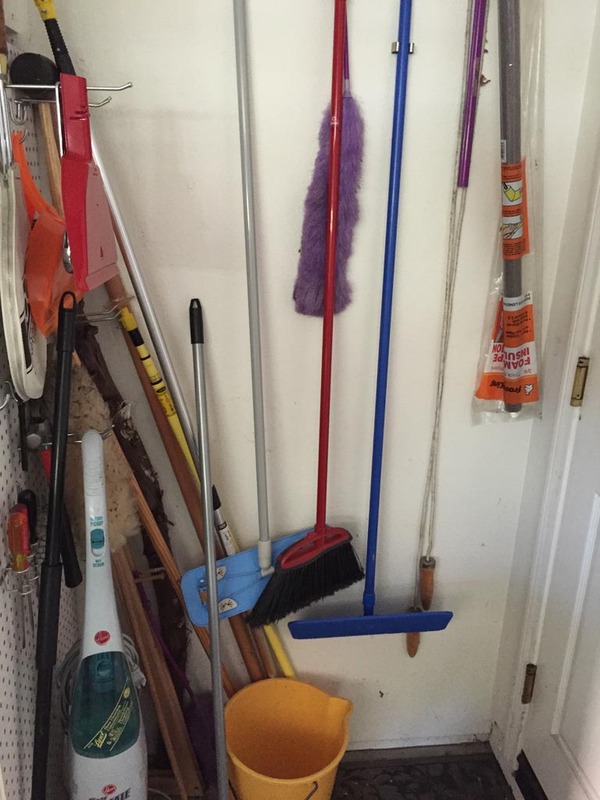 I have cabinets, an overhead storage rack, and most recently I have installed the Monkey Bars System on one wall for the few items with a pole, such as brooms. 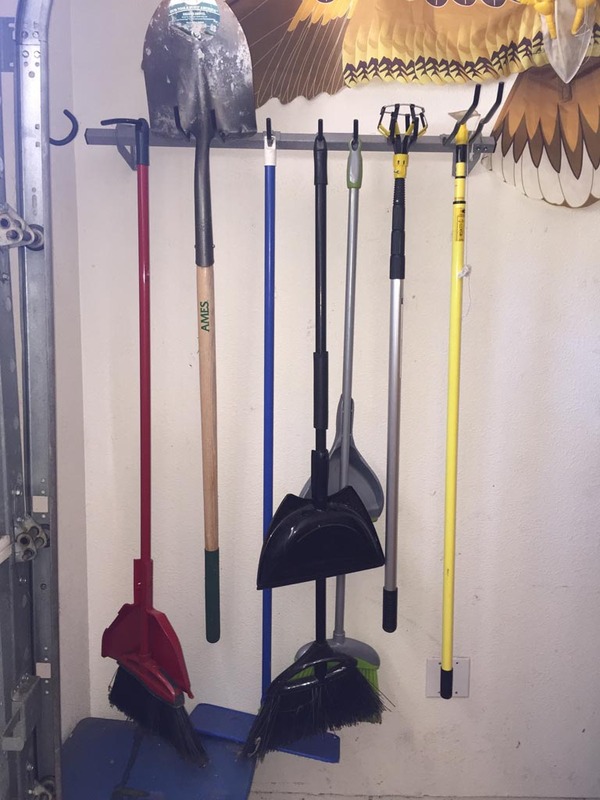 That was like my little ‘reward’ for getting through the garage junk – I got a really great looking and practical item to keep all my stuff easy to reach and out of the way. What are Monkey Bars??? Well, they are not for the kids to climb on. This company makes a collection of garage related storage items that are really well made and functional. The small bar unit, which is just 3′ long, was all I needed for my space. Since I don’t have a lot of garden tools, I decided to use it for household items like brooms, mops, plus the one shovel I happen to own that was lounging around in my yard. The unit installed in less than 30 minutes and that included moving some things around and finding the studs in my wall. The actual installation took maybe 12 minutes. Seriously. Once it was up – I had my items hanging on it in about 4 minutes and ‘Voila’ I have all the stuff that was stacked behind the entrance door now beautifully tucked away. Want proof? Check out my before and after shots. So, take these precious few weekends left before the weather becomes too cold and nasty to want to work in and go through that garage – then come Spring time you will be able to marvel at this wonderful tidy space.